PouchBoats.com ... the boats you carry in a pouch. ... the boats you carry in a pouch. 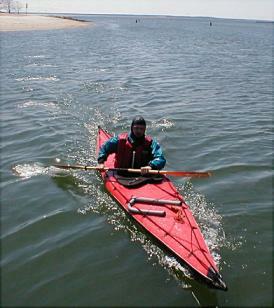 Folding kayaks are tough and durable, up to the demands of modern expedition and military use. Folding kayaks are flexible and versatile, easy to store and quick to deploy. A folding kayak can be your once in a life time paddling investment. There are boats from the 1950s going strong to this day. I have been paddling mine since the early 1970s. Pouch folding kayaks are built by Poucher Boote GmbH in the city of Pouch, Germany. We import Pouch folding kayaks to the USA. We back our products with a full money back guarantee. (Details under Price & Ordering). There are really no "good" or "bad" boats! Different boats are appropriate for different paddlers in different situations. Under this motto we promote the concept of folding boats. Solid information is what we offer you on this website. Facts, impressions, ideas, philosophy and some de-bunking of myths about Pouch boats in particular and about "skin covered folding frame boats" in general are gathered here. Please add to the collection, tell us your ideas, ask us questions ... Please call (425) 962-2987 or email us at . A Point of Tradition: It is one of the earliest folding boat traditions for the paddler to name the boat. We strongly encourage you to do the same - and let us know about it! By the way, when referring to the boats, treat the word Pouch as if it were attached to a kangaroo -- even if the inhabitants of Pouch like to hear the name of the city pronounced slightly differently. Personal disclaimer: You may find Ralph Hoehn slightly biased towards Pouch boats. I have solid reasons to be: I have been paddling them for 30 years.